Right of Blood (Jus sanguinis) and Right of Soil (Jus soli) are two most popular nationality law systems in the world. It is quite important to understand the differences, as they are the foundation for certifying the Romanian Citizenship. Why Romanian nationality law is good for you? Right of blood has its benefits, especially if you were born outside Poland because Romanian Citizenship is not determined by place of birth but by having one or both parents who are citizens of the state. Also, if any other of the ancestors in your line of direct kinship were Romanian and you can prove it, you can also claim your right to certify your Citizenship. This is when vital records become essential – they recreate the line of descent, and therefore the right to claim the Certificate of Citizenship (we have written more about it here). So why Romanian birth certificate is not enough? If you were born in the United States of America, Canada, Brazil, Mexico or a few other countries, you got your citizenship because you were born on the country’s territory, even if your parents had different citizenships than the local ones. In theory, if your parents were on vacation in Mexico, during which you were born – you are automatically a citizen of Mexico. However, for example in Australia, where jus soli is restricted, the situation is different. You can acquire Australian citizenship by birth only if at least one of your parents is an Australian citizen or permanent resident or you can get it after living the first ten years of your life in Australia regardless of your parents’ citizenship status. Therefore, Australian nationality law is a mix of right of soil and right of blood. From jus sanguinis, we have the variant where one parent is a citizen or resident, but you can also get you citizenship because of being born in Australia and living there 10 years – which is clearly based on jus solis. So what the birth certificate actually proves is where you were born and provides the data regarding your parents, doesn’t actually bring any information of your right for Romanian Citizenship, even in such an obvious situation as the example with vacation in Mexico. If you were born on a vacation like that, your parents would have to go through a procedure of certifying your citizenship. There are things that may interfere with the right of blood. 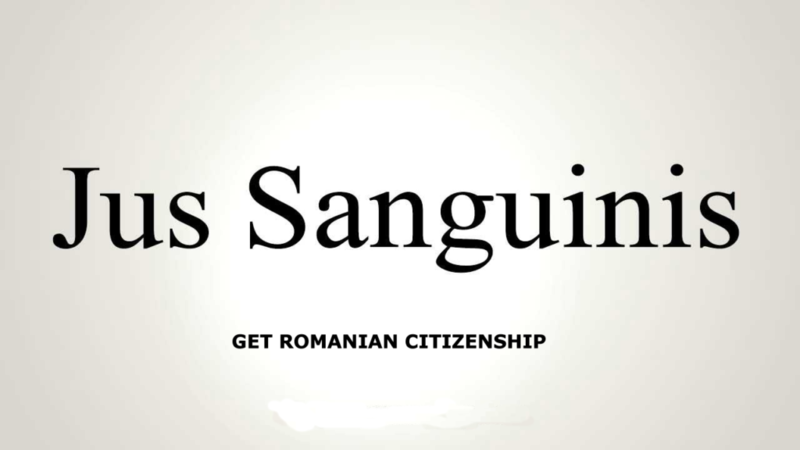 If your ancestor renounced to Romanian Citizenship, the chain of the Romanian citizenship is broken. Even in this situation, the law provides that the foreigners who in the past had Romanian citizenship, but lost it, or their descendants up to grade II (children, grandchildren) can apply for the restoration/acquisition of Romanian citizenship. If you want to be absolutely sure whether you are eligible or not, take our free eligibility test. We will check it for you! We hope this article makes it easier to understand what role the nationality law in Romania has in getting the Romanian Citizenship certificate. Nevertheless, if you have any questions, please contact us.